From Plato's Ion to works by contemporary philosophers, this anthology showcases classic texts to illuminate the development of philosophical thought about art and the aesthetic. 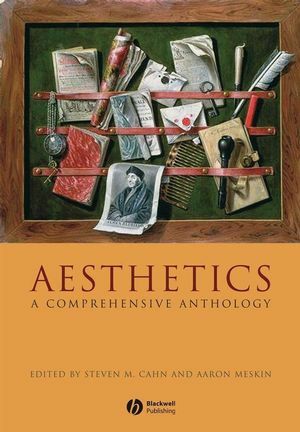 This volume is the most comprehensive collection of readings on aesthetics and the philosophy of art currently available. Steven M. Cahn is Professor of Philosophy at the Graduate Center of the City University of New York. He is the author of nine books, including Fate, Logic, and Time, Saints and Scamps: Ethics in Academia, revised edition, Puzzles and Perplexities, second edition, and God, Reason, and Religion. He has also edited or co-edited some thirty volumes, including Classics of Western Philosophy, now in its seventh edition. Aaron Meskin is Lecturer in Philosophy at the University of Leeds. His publications on aesthetics have appeared in the British Journal of Aesthetics, the Journal of Aesthetics and Art Criticism, Philosophy and Phenomenological Research and a number of anthologies. He is also aesthetics editor for the online journal Philosophy Compass (Wiley-Blackwell). Aesthetics: Classic and Contemporary Readings. Edited by Cahn and Meskin. 1. The Modern System of the Arts: Paul Oskar Kristeller. 6. Ennead I, vi: Plotinus. 7. Of Music: St. Augustine. 8. On the Reduction of the Arts to Theology: St. Bonaventure. 9. Characteristics of Men, Manners, Opinions, Times: Third Earl of Shaftesbury. 10. Inquiry into the Origins of our Ideas of Beauty and Virtue: Francis Hutcheson. 11. Of the Standard of Taste: David Hume. 12. Philosophical Inquiry into the Origin of our Ideas on the Sublime and the Beautiful: Sir Edmund Burke. 14. Critique of Judgment: Immanuel Kant. 15. Introduction to Modern Theories: Christopher Janaway. 16. Letter of an Aesthetic Education of Man: Friedrich Schiller. 17. Philosophy of Art: Friedrich J.W. Schelling. 18. The Philosophy of Fine Art: Georg W.F. Hegel. 19. The World as Will and Representation: Arthur Schopenhauer. 20. The Beautiful in Music: Eduard Hanslick. 21. The Birth of Tragedy: Friedrich Nietzsche. 22. What is Art? : Leo Tolstoy. 23. ‘Psychical Distance’ as a Factor in Art and as an Aesthetic Principle: Edward Bullough. 26. The Principles of Art: R.G. Collingwood. 27. Art as Experience: John Dewey. 28. Feeling and Form: Susanne Langer. 29. The Work of Art in the Age of Mechanical Reproduction: Walter Benjamin. 30. The Origin of the Work of Art: Martin Heidegger. 31. Aesthetic Theory: Theodor Adorno. 32. Truth and Method: Hans-Georg Gadamer. Part III: Contemporary Aesthetics and Philosophy of Art. 33. Introduction to Contemporary Aesthetics: Susan Feagin and Aaron Meskin. 34. Aesthetic Problems of Modern Philosophy: Stanley Cavell. 35. The Role of Theory in Aesthetics: Morris Weitz. 36. The Artworld: Arthur Danto. 37. What is Art? An Institutional Analysis: George Dickie. 38. When is Art? : Nelson Goodman. 39. Identifying Art: Noel Carroll. 40. The Myth of the Aesthetic Attitude: George Dickie. 41. Art and its Objects: Richard Wollheim. 42. What a Musical Work Is: Jerrold Levinson. 43. Aesthetic Concepts: Frank Sibley. 44. Beauty Restored: Mary Mothersill. 45. Categories of Art: Kendall Walton. 46. Appreciation and the Natural Environment: Allen Carlson. 47. The Intentional Fallacy: W.K. Wimsatt and Monroe Beardsley. 48. The Postulated Author: Critical Monism as a Regulative Ideal: Alexander Nehamas. 49. Art Intention and Conversation: Noel Carroll. 50. The Ethical Criticism of Art: Berys Gaut. 51. Expressive Properties of Art: Guy Sircello. 52. Style and Personality in the Literary Work: Jenefer Robinson. 53. Emotions in the Music: Peter Kivy. 54. Fearing Fictions: Kendall Walton.